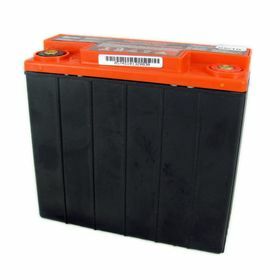 Some batteries provide enormous cranking power while others give you deep cycle reserve power. The revolutionary ODYSSEY PC680 Extreme Racing 25 battery is designed to do both. This is possible thanks to the plates being made from 99.99% pure virgin lead. Pure lead plates can be made thinner, so more can be fitted into the battery. More surface area means more power, up to twice as much as conventional batteries. As a user you will not be disappointed as you will find phenomenal starting power and massive deep cycle reserve power in one battery. The ODYSSEY PC680 Extreme Racing 25 Battery is capable of providing engine cranking pulses in excess of 2250 amps for 5 seconds - double to triple that of equally sized conventional batteries, even at very low temperatures. Extreme heat, high revving, and high vibration engines - the demands of racing need a battery that is up to the job, but lightweight and compact, which is exactly what the Odyssey battery supplies! The ODYSSEY PC680 Extreme Racing 25 Battery can handle 400 charge-discharge cycles to 80% depth of discharge. This extreme combination of power and performance makes ODYSSEY batteries perfect for a range of applications, including automotive/LTV, marine, commercial, and powersports. The prominent rugged construction and packed tightly with pure lead plates, the non spillable AGM (Absorbed Glass Mat) design protects against the shock and vibration that can quickly destroy other batteries. Operating temperatures vary from -40 Degrees Centigrade to 45 Degrees Centigrade for models without a metal jacket, and 80 Degrees Centigrade for models with metal jacket. The batteries can be stored unconnected on an open circuit for up to 2 years without charging. When charged however, they are capable of 100% charge in 4-6 hours, and offer 70% longer cycle life than conventional batteries whilst offering a 3-10 year service life, they are guaranteed to save you time and money! Welded intercell connections enable it to withstand extreme vibration, and AGM design holds acid in place to prevent spills, even when installed on its side. The Odyssey PC680 Extreme Racing 25 Battery measures 184.7mm long, 79mm wide and 169.4mm high. Weighs 7.0kgs and has M6 male bolt terminals. Cranking current rating of 680 Amps. The Odyssey Extreme Series is an incredible combination of power and endurance that makes them ideal for just about anything and anywhere.